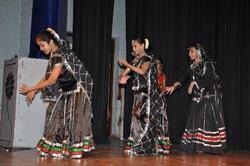 Students Performing Kathak Dance at the Music Festival.We are Classical Kathak dance and Music School. We want to preserve and promote the Kathak Dance Form. All the Folk dances of India as well as Semi classical dance on Bollywood songs are taught. We are affiliated to Prayag Sangeet Samiti Allahabad for all courses in Dance, Instrumental( Tabla & Casio) and Vocal Certification. This is a very beautiful Program where you can enjoy the authentic Classical Dance with Music performed by Local Artists & Performers. Enjoy a delicious Dinner while watching the Private Classical Dance Performance. 4Active Exergaming together 4Active is an innovative product that develops reaction speed, motor skills and balance. Play together with friends or family, up to 4 players. 4Active brings a new twist to the classic dance pad interface. ndian classical dance, or Shastriya Nritya, is an umbrella term for various performance arts rooted in religiousHindu musical theatre styles,  whose theory and practice can be traced to the Sanskrit text Natya Shastra.